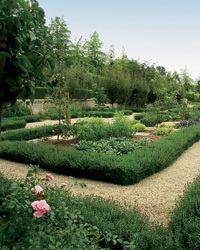 Six chefs around the country share the seeds, tools and organizations that help them grow their new gardens. 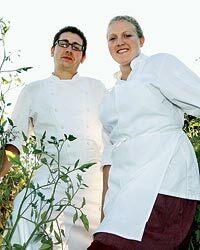 Husband-and-wife chefs Eric Korsh and Ginevra Iverson, of Restaurant Eloise in Sebastopol, California, grow bitter greens from Seeds of Italy. seedsofitaly.com. Bryan Calvert waters herbs for his New York restaurant James with the Bon-Aire Stainless Steel Ultimate Hose nozzle. bon-aireindustries.com. Michael Paley of Louisville, Kentucky’s Proof on Main finds radishes easy to grow, like the Pink Beautys from Baker Creek Heirloom Seeds. rareseeds.com. To nourish the new garden behind Restaurant Eve in Alexandria, Virginia, Cathal Armstrong tosses kitchen waste into the Sun-Mar 400 drum composter. peoplepoweredmachines.com. Chef Matthew Dillon of Seattle’s new Corson Building works with Seattle Youth Garden Works, which teaches gardening to homeless kids. sygw.org.